Harmonie says she participates in the Twilight People project because it seems a good way to tell her story from a spiritual as well as a personal angle. She feels that she never fitted in, neither in her family nor in the community, and she says that she was ”eccentric from birth”. She was very studious but very lonely and isolated. However, she befriended elderly people such as her neighbour who taught her to cook and do gardening. She also remembers being a very thoughtful child and her mother calling her ‘The Dreamer’ or ‘The Thinker’ or as people say ‘ she was away with the faeries’. For her this was a place of safety, a place she was able to go to for an escape, where life became brighter, and to her having this place to go to is a gift. She felt female from the age of 6, and she recalls an occasion when she met herself out in the garden as a 6-year-old. Her mother saw her in the garden having a chat to what she saw as the thin air. When Harmonie was asked by her mother who she had been talking to she replied that she spoke to Harmonie who is a female version of her who comes from another dimension. Harmonie speaks about how punk was a bit of a salvation for her as a teenager. She was able to wear make up and kind of cross-dress and live and hide her femininity at the same time that way. For some time this was sufficient to her. After some struggles with addictions and now a single parent, she started to realize that she had to get back onto a more spiritual path even though she wasn’t sure what exactly that meant for her. All she knew was that she believed in faeries and that they believed in her. She realized she could have her own faith and make her faith whatever she wanted it to be. The spirituality was more fluid and gentle and the word god became also gentler; it was just another three-letter word for love and vice versa. Nevertheless Harmonie says she still felt ashamed by her inner soul knowing it was female. At the end of an AA meeting she got up saying “I am not the person you think I am and I am actually female and my name is actually not my male name and I am actually called Harmonie”. Bit by bit the pain melted away and she was able to start the transition. To her it was the trust in god and believing in a power greater than her, and believing that God is loving and caring that helped her on this journey. Harmonie sees this process as a spiritual awakening. She believes she found her way by being honest about how she felt, what was happening and allowing herself to be wrong. “My faith is becoming stronger. My femininity, my understanding of being female is becoming clearer. My heart is intrinsically feminine. When I look in the mirror I see a girl look back and that is kind of what I always wanted to achieve and I don’t have to drink and I don’t have to take drugs to achieve that. But in reality Harmonie says that it doesn’t matter so much to her anymore what other people think about her and it is more important how she feels and thinks about herself. She believes she is a faerie, which to her is connected to having been a hidden person throughout her life in various ways – it links into the story she heard about the hidden people and how she was hiding her drug and alcohol addiction and hiding the strange kid she was. She mentions that there are as many different forms of being a faery as there are being a Christian for instance. There are eight days on which she makes a deeper & more spiritual connection and reflects more than usual: Yule, Imbolc, Eostre, Beltane, Litha, lammas, Mabon, and Samhain. These days are very special to her and she practices rituals and goes back home through deep (journey) meditation. When she meditates she really links into her faith and believes, and in her journey meditation she goes to places, which she believes are another dimension and also her home. In her mind she goes across fields and she goes underground and she goes into caverns which she compares to being in a dream world with her own kind.In this state there is an understanding between each other without words and without speaking. She believes that at those moments she is back with her God and her true brothers and true sisters, and she believes that she is a spiritual being living a human experience. Harmonie believes she is here to find out who she should have been and to help other people while they are struggling with their human experience. She likes to dress up in her faerie role – such as a mythical faerie with wings for instance; it makes her feel comfortable. The same is true for having icons around her in her garden and in her house. Harmonie mixes things from various faiths such as Hindu and Buddhism and she draws from their meditation. She might be dressed in a faery dress for instance singing Hindu and do a Buddhist meditation; it is quite fluid for her. She also enjoys doing ceremonies in the circle in her garden or her friends’ circles, she meditates (God speaking to her) and prays (her speaking to God). 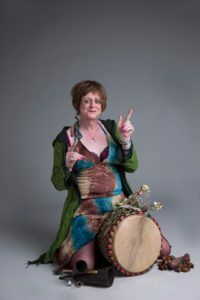 Harmonie speaks about how she likes to dance in her or other people’s circle, playing various drums, sing all of which have a spiritual connection. She also enjoys writing poetry and songs expressing her gratitude to god for her clean time and the people she has in her life for instance. The drum she chose for the Twilight People photo session is called “Noomi”, which she bought on a retreat. She says that she didn’t choose Noomi but that Noomi chose her. The first moment she played her Noomi made the sound Harmonie needed to hear and it was almost like finding a part of herself, tuning into her inner spirit. To Harminie, Noomi looks like no other and makes a sound like no other. Noomi has been in various circles and a couple of countries with Harmonie. And she hears the sound she makes as a female voice but her mask is male. Playing the drum is as much part of Harmonie’s transition as much as her faith is. For her faith is about today and acceptance and enjoying life as much as possible and her faith is very fluid. She enjoys much more now than she used to. To her all this is about showing gratitude about the free life she can live and being able to live her life as a female.